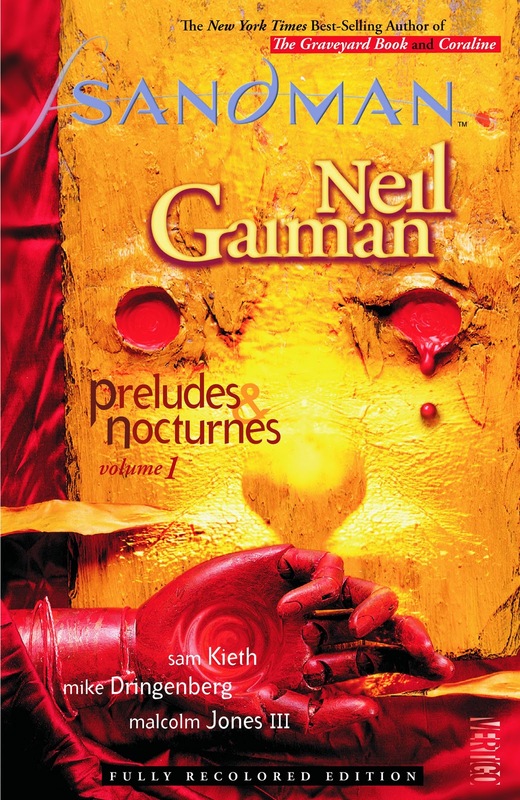 What You Get: The first eight issues of Neil Gaiman’s award-winning series (OR SO I HEAR), an introduction by executive editor Karen Berger, and an afterword by Neil Gaiman. Art by Sam Kieth, Mike Dringenberg, and Malcolm Jones III. The Story: This series falls solidly into the horror genre, so it has blood, gore, violence, and scary and disturbing characters/scenes/plots. The diner chapter, specifically, made me go ARGH DO NOT WANT the entire time. I still enjoyed this book but couldn’t whole-heartedly love it; for those who read and like horror, obviously, this would probably not be a problem. Each issue has a mostly self-contained story, with the first seven issues comprising a “quest” format story arc. In the first issue, we’re introduced to an appropriately creepy cult that tries to capture Death for their own purposes, but being incompetent creepy cultists, they capture Dream instead. Eventually, of course, Dream escapes and sets himself to righting his wrongs and getting back all of his stuff. The eighth issue in the volume introduces us to a character important to Dream and is obviously a lull in between two arcs. When he’s in the human world, he’s a scary-looking dude with awesome clothes, but in dreams and the dream-world he is extremely powerful. A large part of the fun (so to speak) in this story is watching Dream use his powers in different ways, using dreams to scare, punish, trap, or teach people. He’s a scary kind of dude, I think I mentioned. He visits Hell in one issue, which turned out to be one of my favorites, partly because of the fantastical (and terrifying, yes) depiction of Hell, and partly because of the conflict which pits Dream against a demon in a contest (to get his afore-mentioned stuff back). The supporting characters are definitely a mixed bag. The ones I liked and hope come back are Dream’s clothing (obviously the best supporting character), Death, and John Constantine. John Constantine is the closest we get to a decent human sidekick who helps Dream out. The incorporation of Cain and Abel was very interesting, presenting them as archetypes of a sort who live their story over and over again, but that was disturbing and they were disturbing. There were various others who show up only to die horribly, of course. I didn’t know ahead of time that this story takes place in DC’s universe, but then Arkham Asylum was there (because we needed more creepiness!) and some cameos from Justice League International characters (which made me really happy). The Art: The different artists managed to make the overall style in this volume stay coherent, which I apprecaited. I liked Sam Keith’s style for Dream best. Dream’s clothing is my favorite thing about the art, as you might have surmised. I loved the three witches (or fates or whatever name they’re going by) and how they look like all the stereotypes of those archetypes combined. The art is creepy and the bad guys are really gross and there’s lots of goopiness everywhere always. I enjoyed seeing Martian Manhunter and Mr. 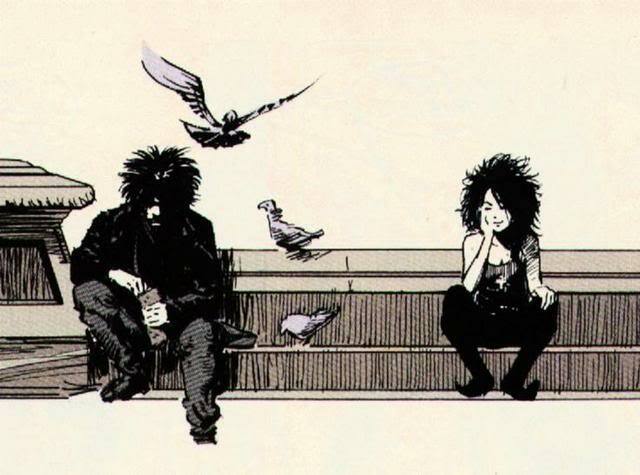 Miracle in a book so completely different from anything else they’re in—the art made them seem like really different characters, even though their behavior was consistent. “A Hope In Hell” had the most fantastic backgrounds. I really loved the issue covers by Dave McKean. They’re not your usual “put random scenes on the comic so people will pick it up!” covers, but instead vague creepy portentous things.